Upgrade your reporting and analytics to give operations, regional managers, marketing managers and leasing teams unprecedented visibility and actionable intelligence into the lead-to-lease process. We cover everything from basic block-and-tackling reports to advanced cohort, agent and source analytics. Get deep insights into the performance of each agent on your leasing team. Understand their conversion effectiveness, their ability to push a prospect through the funnel, the activities they complete to get more leases and, finally, identify specific prospects that need an agent’s attention. Who is the more effective agent? In this example, Agent Lisa has better Leads-to-Toured and Leads-to-Leased ration than agent Lance. 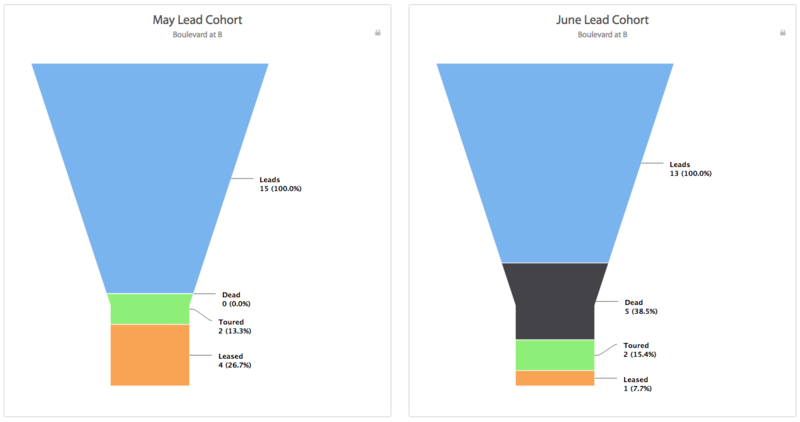 Which phase of the funnel should the agent focus on? In this example, agent Lance's prospects don't seem to be moving beyond the New Prospect state. Perhaps he needs to spend more time reaching out to new prospects and push them along the funnel. How does the activity mix of the top performing agent compare to the lower performing agent? In this example, agent Lisa makes more calls and sends more emails than agent Lance. The number of touches is clearly impacting the conversion ratios of Lance. Are we paying enough attention to our most promising prospects? This report gives you visibility into prospects that have not been given enough attention and deserve to be contacted soon. What are the best sources of Leads? Best sources of Leases? Are all sources of equal quality? Find answers to these in the source performance reports. 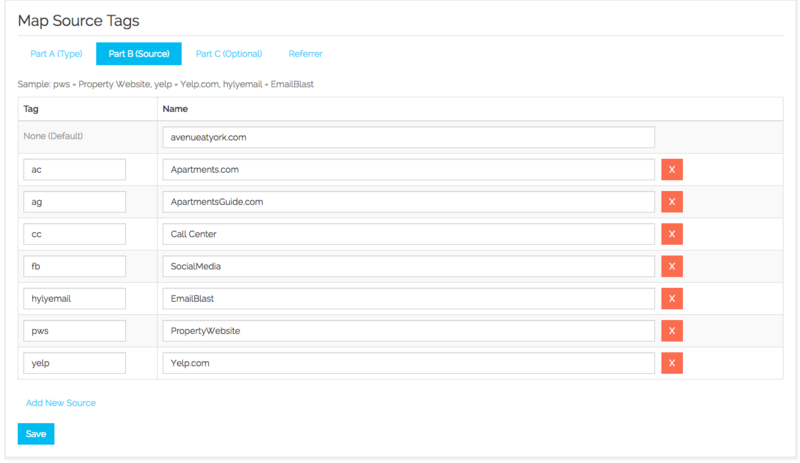 Channels in Hy.ly CRM define the medium – web, phone, email for example — used by the prospects to get in touch with you. Sources drill down one level lower than channels and will include the list of ILS, specific social media channels, etc. Define your channels and sources for each prospect. The same definition is now used to identify the source of a prospect. 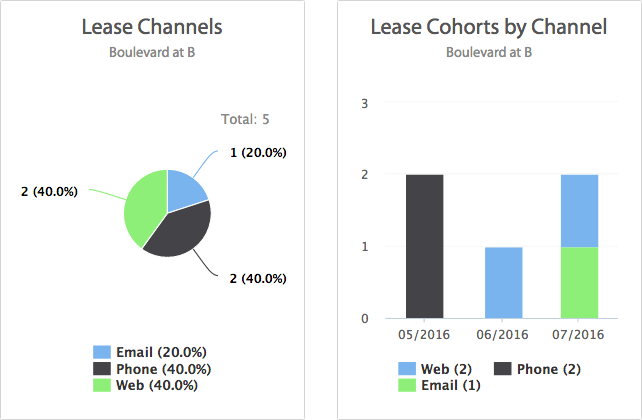 Plot your leads and leases by channel using pie charts, tables, cohort or period analysis. 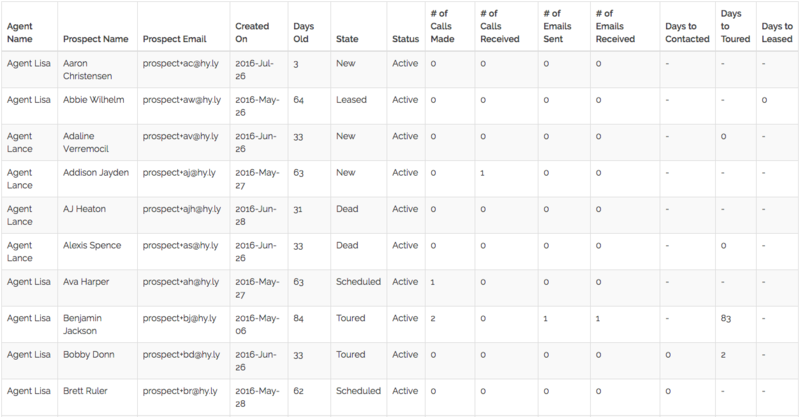 Plot your leads and leases by sources using tables, column charts, pie charts to get the analysis you want. Cohort Analysis gives a truer picture of conversion effectiveness than the normal Period Analysis. Period Analysis results in erroneous conversion ratios. For example, the May lead-to-lease ration will compare number of May leases to the number new leads in May even though the May leases originated as new leads in March and April. Cohort Analysis eliminates this error and follows a group of leads that signed up in the same period. Thus, the May lead-to-lease ratio will compare number of leases in May to number of leads that originated in May. How is the May Cohort different from the June Cohort? In this example, the May cohort has resulted in far more Tours and Leases than the June Cohort. In addition, the June Cohort resulted in a far more dead leads. Perhaps, one of the lead sources in June did not send good quality leads and should be turned off. What are the conversion ratios for the different cohorts? 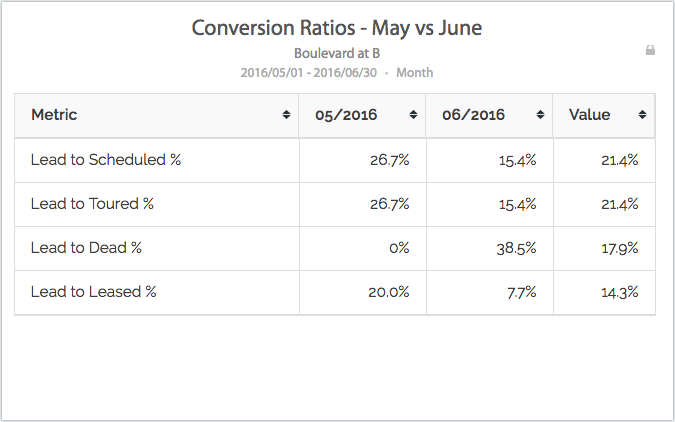 In this example, the lead-to-scheduled, lead-to-toured, lead-to-leased ratios are much higher for May than for June. On the other hand, the negative lead-to-dead ratio is higher for June than May. Again, pointing to poor quality of the June leads.